Compelling marketing content delivers information in a friendly, trustworthy, non-selling manner. It informs a reader while also making her interested in your products. 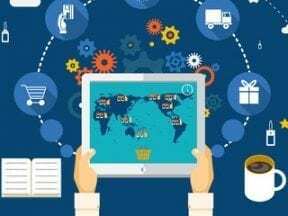 Content is an essential part of an overall marketing strategy for online merchants, including those in the fashion industry. But most smaller fashion retailers don’t typically have the budget for a professional content strategist. Most adopt a do-it-yourself approach. In this post, I’ll describe an affordable content marketing strategy that works for my clients, industry leaders, and me. Website text. The text on your ecommerce site provides helpful information and optimizes your site for search engine rankings. Product descriptions. Use at least 100 words — the more, the better. Describe the product, its benefits, and ways to wear or use it. Provide detailed measurements even if your website has a fit guide. 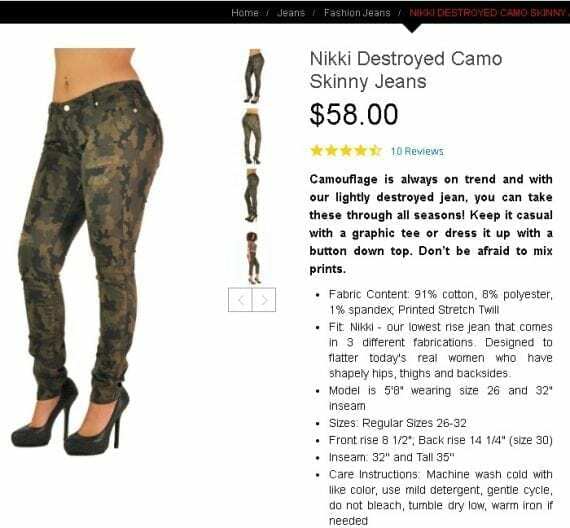 For product descriptions, such as this example of camo jeans, use at least 100 words — the more, the better. Describe the product, its benefits, and ways to wear or use it. Source: Poetic Justice Jeans. Category and subcategory text. Tell a story about why shoppers need the product. For example, if you sell candles, explain the benefits of decorating with candles. If you sell shoes, list latest shoe trends and style advice. If you own a fitness studio, provide details of the classes and how they help attendees. About Us page. Business owners frequently make the mistake of offering tons of facts about themselves and their work journeys. However, all that shoppers care about is what you can do for them and how your product can improve their lives. On your About Us page, focus on the benefits to your shoppers. FAQs. For a frequently-asked-questions page, list as many questions, answers, and topics as is feasible. Research your competitors’ FAQs and make yours better, more comprehensive. Address even minor details. Shipping and return policy. Be crystal clear and easy to understand from the start. Blog posts. If you don’t publish useful articles and guides, your competitors will do it for you. Seventy-seven percent of consumers read blogs, according to the Content Marketing Institute. Moreover, blog posts attract the bulk of organic traffic to most websites. Lead magnets. Enticing content that’s gated — requiring a shopper’s email address to access — can be a reliable (and affordable) source of leads in my experience. Examples include fashion tips, makeup advice, celebrity fashion trends, and more. It’s a good way to obtain quality leads who are already interested in your product or service. Lead magnets are a good way to obtain quality leads from shoppers who are already interested in your product or service. 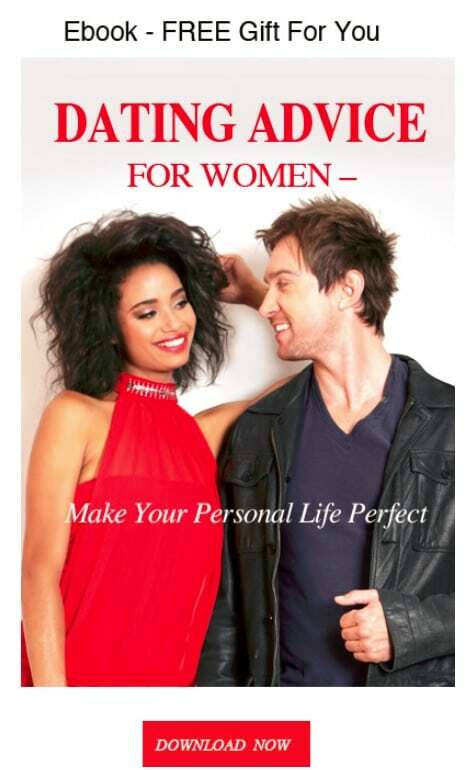 This dating guide is from ForYourBigDate.com. How-to guides. The more quality guides on your site, the more time your shoppers will spend on it. Helpful how-to guides are highly popular in my experience. Helpful how-to guides are among the most shared information — with friends, followers, family. This skin-care guide is from FreePeople.com. Video. On-site, YouTube, Facebook — you name it. Consumers love watching and sharing informative and entertaining videos. Plan videos carefully. Write a script first. Most of us speak 150 words in one minute of video. Make YouTube videos longer than seven minutes. Showcase your company, your employees, and working processes, as well as your products. Use keyword-focused file names. Especially for YouTube and your website, always name video files using keywords you want to target. Graphics. Product images, infographics, holiday guides, collages, lookbooks — all could make your site authentic and your social media posts memorable. Invest in a talented graphic designer who understands your products and your target audience. Infographics are typically the most shared content. Infographics are time-consuming to create but worth it. Website. Think of the content on your ecommerce site as a high-producing salesperson. The better the content, the higher the sales. Social media. Provide product information and educate, entertain and communicate with existing and potential customers — all at the same time. Your content should be useful, eye-catching, and irresistible for sharing. Email marketing is the most profitable promotional channel for most merchants. Content marketing has two key parts: creation and promotion. Take both of them seriously. Creating content. Plan your content for up to a year to help coordinate with other marketing and promotional channels. Have one master content calendar and separate calendars for each content channel. Create content in chunks to save time. Schedule content to post automatically, such as on your blog, social media site, and email deployments. Make content keyword based and search engine optimized. Test blog headlines and email subject lines to increase readership and open rates, respectively. Be persistent. Don’t stop producing new, fresh content. If you cannot generate something new, reuse and repackage old content. Update popular blog posts and guides when appropriate. Promoting content. Content is useless if no one reads it or views it. A strong content promotion strategy is essential. Allocate your advertising budget to promote your products and your content. For example, if you sell plus-size fashion, advertise your “Ultimate Capsule Outfit Guide” with a signup form, to generate leads. Combine content and influencer marketing. Use influencers to promote your information to their audiences in addition to your products. Don’t ask influencers to just share your content. Ask them to review and advise. Include your content in transactional emails. This provides additional value to customers.